The absorbent construction tarp is the perfect solution to containment of oil, leaks, and liquids under vehicles. Made from a combination of high strength and oil absorbing materials, the oil spill mat works to effectively protect and contain contaminants on your site. The absorbent tarp is manufactured in a three layer system that protects the mat while also absorbing oil. The first layer consists of a geotextile and allows oils to pass through. The oils are then caught by the second layer, which filters the oil out and allows only clean stormwater to pass through. The third layer is leak-proof material as an additional protection and containment layer for catching leaks and spills. The oil spill mat contains leaks and reduce falls due to facility spills. 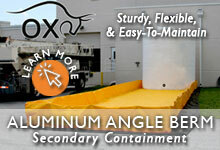 How Does the Absorbent Tarp Keep You in Compliance? If you have questions about the construction tarp, give us a call at +1-772-646-0597.